Don't believe bottom up company cash flows give a much better picture as they are driven by debt creation. State owned entities borrow heavily to pay for government supported (local) projects. This generates company cash flows, which thus suffers form the continued debt creation issue and says little about sustainability. Ultimately, the debt issue will be a big temporary headwind, but the Belt and Road initiative is a much bigger deal and will be so for years to come, mitigating the consequence of the current debt issues. Something the rest of the world (excl. directly impacted countries) will not have to help it deal with its debt issues. So, not sure what is meant by "the end game". China is just getting started, though will have booms and busts along the way. The bigger issue is the west's push-back to the integration with Russia, India, Turkey, Syria, and Iran to enable the full potential of the Belt and Road's integration into the European economy. Then of course, there is the China investments into Africa. The only place where the population is growing. China's Great Wall of Debt is a good read and provides perspective into just how opaque the economy really is. 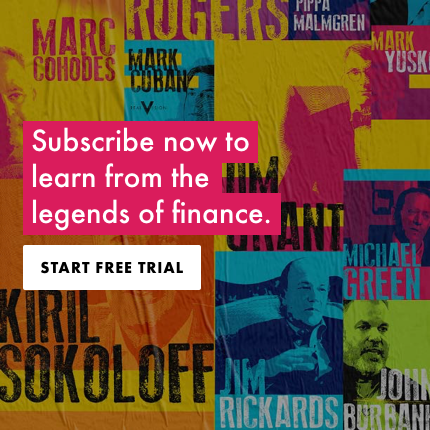 Awesome, this interview makes me remember Martin Armstrong's economic cycle. I believe the turning point 2015.75 was the peak in China's economy. Commodities peaked in 2012/13 but there were still a number of infrastructure projects that continued into 2015.75. MA says that 2015.75 was the peak in confidence in government. Perhaps. But, maybe it was the peak in China? Interesting that the stock market peaked in June 2015 - three months before Armstrong's economic confidence cycle. Maybe we see China and its stock market bottom in 2020? A lot of the fundamentals (i.e. the excellent preso above by Leland Miller from China Beige Book) point to this happening. Feliex Zuluaf also talked about China's economy heading down into 2020/21 for a few reasons, which make sense. Indeed, a lot of this is starting to make sense...commodities seem extremely weak at this stage. Great presentation. Perhaps you can get Diana Choyleva to elaborate on some of these points, and talk about why she thinks the US and China are destined for a protracted trade war/clash over the next few years and decades. She is a fantastic China watcher! Off topic but been annoying me for a while now. Can we please get a volume control on each video? Very impractical (and poorly designed) to control with the general volume button. Hi Gregor - This is on our to-do list so not a long until we'll have it on. While I respect his right to his opinion, I couldn't disagree more. In particular, about the benignity of BRI. Superb....no interviewer...just knowledgeable..to the point..no stumbling around..An organized mind. Meanwhile on FinTwit, everyone is talking about Alibaba and this blog: https://deep-throat-ipo.blogspot.com/ (h/t in particular to Josh Wolfe). I haven't gone to the bottom of it yet, but it sure looks like a very interesting source. Reminds me of the good old days, when ZH went through all the footnotes in derivative prospectuses. The yuan may be managed, but when a $500 billion Alibaba trades on the NYSE, it sure looks like a good proxy to trade. Time will tell! Very interesting conversation. One has to wonder whether the Chinese leadership may actually pay attention to Beige book numbers as a way to know what is really going on in their own economy - that's why they allow outside collation to occur.Chinese leadership may accept the fact that if some of their data are massaged for internal/external appearance, then it's possible that most of their data is made up by regional management keen to toe the line. Therefore, Chinese leaders have no real idea of what is happening in their own economy. Beige Book to the rescue - just summizing!! Great episode RV - well done. China awash in debt! So is the rest of the world! Also...why you are able to do what you are doing is because you are sitting in New York as an American citizen. It's not like you are going on Chinese state media as a Chinese citizen. interesting perspective however without knowing how his survey process works not sure how credible the information is or better than the guessing he is so critical of. If he is surveying state owned businesses/organizations or controlled by same, not sure how "independent" his process is. Enough with criticizing the music,one I like it,two if its too loud,turn it down or mute! RELAX! And I kinda like the music. The thesis of the discussion is spot on. Its hard to read the tea leaves through cloudy tea. And, since the government is, or can be, on both sides of many deals, some fears are more about perceived catastrophes and real ones. what makes the already terrible music less forgivable is its volume. Goodness. It's both loud and annoying, every time. Milton, please. Asian based western expat here. Watched it twice. His work is legendary and invaluable. He doesn't do market calls per se, but his organization is highly useful for anyone who works in markets. Monitor his work rather than some of your big name "star" managers who I won't name but clueless about Asia and have been wrong for many years, repeatedly. Thank you Mr Miller, I tip my hat to you. Great job RV to produce this. Asked for the n-th time, why not try a cage match against Kyle Bass? Gordon, it's not just Kyle Bass who has missed calls time and again. Some fund pundits have been wrong much longer. Tough business I know, but in one case, 17 years of shorting China hasn't been a great trade. Some smart money (eg., Evergreen Gavekal - with which I have no association) positioned clients long this month and have already done very well on the reversal. Kudos. David, I get what you are saying. The question in my opinion could also be timing. 17 years is probably being wrong, but what if someone is too early, is he/she automatically wrong? In any case, I think the RV audience would learn a tremendous amount by watching a debate between people of opposing high conviction opinions. I am definitely craving for that day. just wasted half hour watching this guy puke. why? would be nice to get your view? Biggest takeaway from this interview was a really thoughtful insight: "GDP is a made up concept. GDP doesn't measure productive activity. If you want to have higher GDP you just build a bridge, you tear it down...Never been a good way to understand if China is using capital productively." Very interesting lens not just for China. TY, LM. Yes, GDP is a very flawed concept and rather bogus, but we haven't much else to work with. Except at least it's a substantial improvement to at least must use PPP GDP. For example, suppose in country A it costs $200 for a hairstyle and $200 for some lawn maintenance. Thus a hair trim and lawn trim is $400 of GDP. But if in country B the same things cost $25, then its GDP is calculated as $50 for the identical productivity. Someone then falsely claims that the total GDP of country A is 8X as much as country B - when in fact they're identical. Thus the need for PPP GDP, which strips out some of the nominal pricing nonsense. Otherwise it's analogous to saying, Venezuala's stock market has been the best in the world, which it might well be on nominal terms, but not if you make comparisons on currency-adjusted terms. A takeaway from this is that in fact the US is the largest economy in the world in nominal terms, but not in real terms. It becomes an even more thoughtful insight when one applies such insight at the global level. So "GDP has...never been a good way to understand if ____________ is using capital productively" and you can fill in the blank with whichever country you like. Can anyone direct me to detailed analysis of what happens if usd/cny passes 7 ? I have been hearing the whole devaluation is bad narrative for the past couple of years, but exactly how that is expected to look across the global financial markets seems to get blurred. refreshing. interesting thinking. good value. Good show. Gutsy call made right on the day of the nadir of the US/Dollar's bear market rally (and indeed since Aug.15 the dollar has massively collapsed and is headed way more down even more from here). Followers or subscribers of Martin Armstrong will note Mr Miller's secular outlook for China matches that of Armstrong per his new in-depth report last week explaining how, why and when China will become the unchallenged financial capital of the world with the globe's dominant economy & military. By 2032 at latest, just 13 years or so away. The USD has massively collapsed? A little too hyperbolic there. Tq, tho that's just for my fund, NOT me personally, I wish, haha. What percent of the fund did you dedicate to the EUR trade? Just wanted to know if it was a high conviction one. Not everyone talking a strong dollar is a 'clueless talking head'. Nothing wrong with a little respect for a different opinion. You don't understand the relative strength of the US/China Naval power. William, yes I do. Take it up with Martin Armstrong, dubbed "the Forecaster" for good reason, before simply thumbs down. At least read his work or attend his next conference in Orlando or Singapore for $10K, because with a most enviable track record in markets & geopolitics spanning five decades, his analysis is at least worth your consideration. Trade Deal or Trade War? Why Does China Tolerate You?